protects and extends the life of my wood table! Sturdy, strong, easy to wipe down, nice big size...and best of all they are virtually invisible and don't cover the antique oak grain of the table. I love them! These are great to use over your favorite cloth place mats. 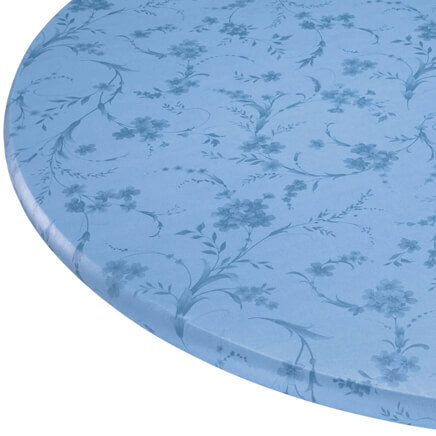 Save your place mats from multiple washings and protects from stains. i USED THIS AT CHURCH TO PUT UNER THE ELEMENTS-AS THE CHILDREN AND SOME ADULTS WERE GETTING THE GRAPE JUICE ON THE WHITE LINEN AND THIS WORKED PERFECT! THANKS SO MUCH!! These placemats were of exceptional quality. They do not curl or warp. I could not ask for better, thank you! I place these placemats over my own placemats to preserve them. Sometimes I place photos underneath them to surprise my guests! Nice plastic, stays flat on table, very clear. Just works really well. No problems to report. This product is being used to protect my new wood dining room table.It does not detract from the beautiful color and grain of the wood.I would recommend them!! Place over expensive cloth placemats!!! Great in my art studio! I love these! I use them in my Art Studio to protect surfaces under my paint palette, paper towels, water jars, etc. I also use them under plants, and to line shelves. They're even great for reinforcing a floppy tote bag! I love these and ordered more because I use them in several places around the house, including counters and furniture tops. I cut one to fit the top of my dresser to protect the wood from my hair care products. I also use under my cat's dish and save lots of clean-up time. I put them under my cloth decorative placemats and slip them on top during meals. If I put them on top, it takes away from the beautiful cloth mats. Everyone knows they have to slip the plastic ones on top when they sit to eat. I have done it this way for years and my cloth mats still have the crisp new look because I have not yet had to wash them. extended bar in kitchen doesn't hide the new countertop. I love these placemats! They protect , and yet let my pretty cloth shine through. I wanted a clear placemat for my counter top. I previously had a set that were clear with raised white stripes. They were very hard to keep looking nice. These are much easier to clean. I am very pleased with these transparent placemats. Best feature: they are sturdy. I have synthetic/plastic placemats that are flimsy. They look great, but when you hand wash them they are floppy - so much easier to have a firm placemat that will "stand on its own" to air-dry. Highly recommend. Just what I was looking for to cut down on crumbs sifting through under the lace tablecloth, without taking away from its beauty. Also enjoy it on bedside tables to keep soil and water marks from ruining finish. Very pleased. I got two sets and could have used more ! I have looked for placemats like these forever! They surpass everything I hoped they would be and do. Saves from using paper toweling and cloth, great for everyday use and entertaining without distracting from room decor. Wonderful for meals with my grandchildren without worry of soiling or damaging the tabletop or table linens. Useful for eating on top of table without having to use a tablecloth. Also gave a set to adult son for use on coffee table and/or under pet dishes to keep carpet clean! These are really nice, sturdy placemats. They are crystal clear so the table or tablecloth they are on shows through, making them useful all year around and for any occasion. They are a nice size, too. Large, but not overly so. Nice way to protect tables and tablecloths. These placemats are the perfect size and look great on my butcher block kitchen table. Not used as placemats! I use them for counter protectors in kitchen. Wet dish cloth, wipe one side of mat, wipe counter, place the mat where slicing or chopping done, wipe entire top of mat to get air out between bottom of mat & counter. It will stay in place for days & days. When it works loose, repeat! Since they're clear, they're not even noticed until someone gets right on top of them. I have been looking for these clear placemats for some time and was happy to see Miles Kimball had them. I use these to line my cabinets and also line my refrigerator. They are cost effective, lie flat, keep my shelves dirt free, and last for years. Bought one set and reordered two more! Perfect to show off my placemats or tablecloth. Barely noticeable and easy to wipe up spills. My neighbor was so jealous of the elegance of my table setting that I had to order 2 more sets for her! 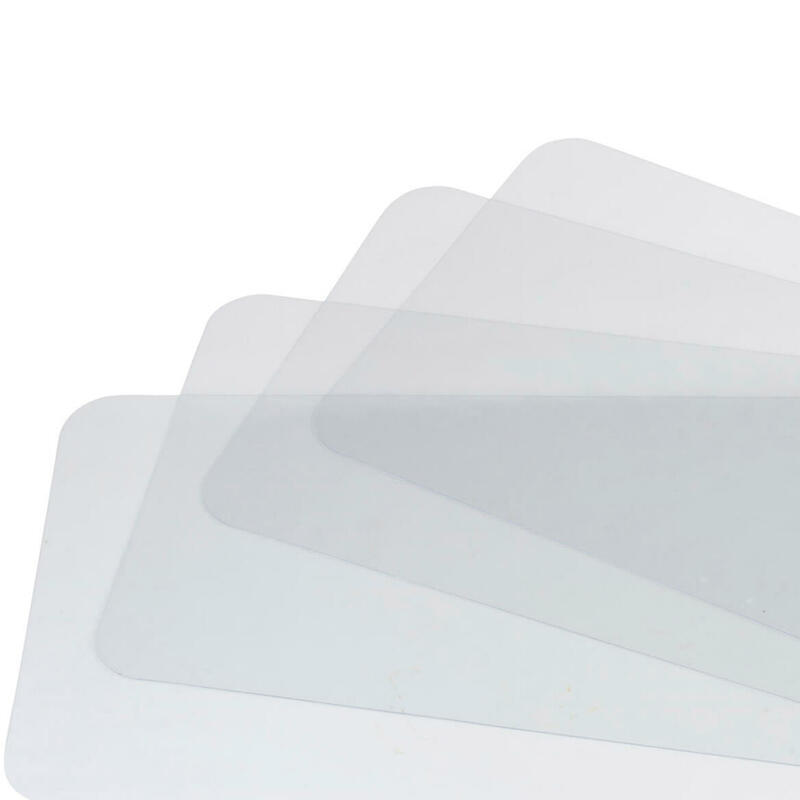 I use these placemats to protect the wooden surfaces of my coffee tables and my end tables. I do have coasters available but they are not always used by the members of my family! I have been buying these placemats for many years and I hope they continue to carry them! My three kids are finally old enough that I can have a cloth table cover. No more vinyl ones! These placemats are perfect. My pretty fabric shows through. Easy to wipe clean. Perfect for use over our nice tablecloth! I have purchased these for myself as well as for others. They're very practical. all in all - great. These placemats are simply terrific. Whatever you place them on, they let the beauty show through. The clear matts show off the table/coverings while keeping things clean. These are great because you don't even notice they're there and they protect the tablecloth. I use a tablecloth often. 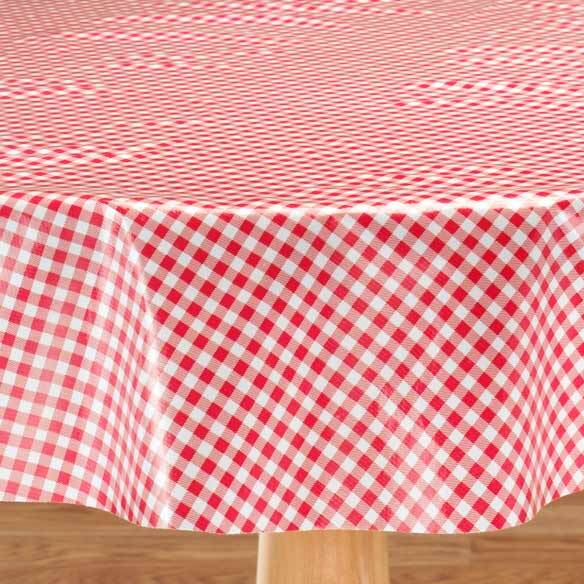 Like to have the children at the table with us, The clear placemat lets the tablecloth pattern show so its not obtrusive to the table scape. This is especially important with a company setting. Also allows for much less frequent cloth washing from family meals. I LOVE them. I have some lovely placemats I was hesitate to use because I didn't want them ruined. But with the covers I can leave my good mats out on my dining room without worrying. I can also use them on my kitchen table over any mat and not worry about stains that won't come out. Miles Kimball has products you need but never thought were available. Simple products that work! You can paint a design on one side to show through. I like because it protects my table I just painted. You could draw circles on to show where plate goes, glasses go, even silverware for children to learn. I use over tablecloths. Then I just wipe the mats off. That way, the tablecloth shows through, less washing machine for the tablecloth, yet so serviceable. Both my Mom and I are using them. Remember to get one for the center of the table too. Mom uses them also at their bar in kitchen. A friend had these & after seeing the quality, I decided to order several sets. I use them on the stone countertop each side of the stove to catch splatters, the breakfast bar & either side of my bathroom vanity (to protect the marble top). If you have a matte surface, you may not care for their shininess, but as mine are polished, the placemats are hardly noticeable & doesn't detract from your decor. The only drawback is that you can't get them custom sized! :>) I think they'd be great for families - especially those with small kids, as well as the elderly. i bought it twicei ues it for my dining room table. Keeps my good Placemats clean. I have bought several times; and have found so many uses! I recently had my kitchen table refinished. 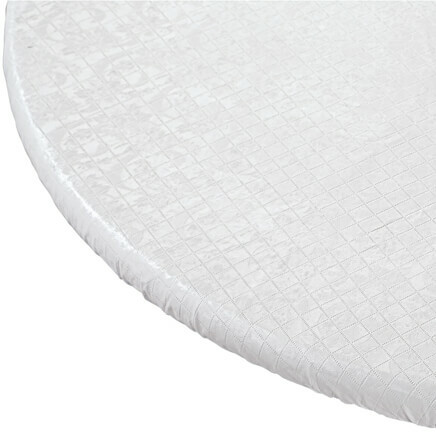 Because of the clear mats, the beauty of the table can be seen & protected! Clear placemats go with any tablecloth. So my decorative table linens can show through and still be protected. I wanted the 8 pack but it was no longer offered. It cost more but I ordered 2 - 4 packs to suit my needs. To make my tablecloths last longer without stains. I have four now and I use them over my cloth placemats for holidays. I need 8 for when the family is here. If these are like the ones I have, I'll be ordering 4 more in the future for larger gatherings. By using these, I'm not constantly washing and ironing the cloth placemats. I am replacing ones that I purchased several years ago that have gotten scratched and worn.They last a long time and I use them on some of my wooden furniture for protection. I use these to protect my walls behind dog food bowls and as splash guards behind washroom sink. protects wooden surface of table. 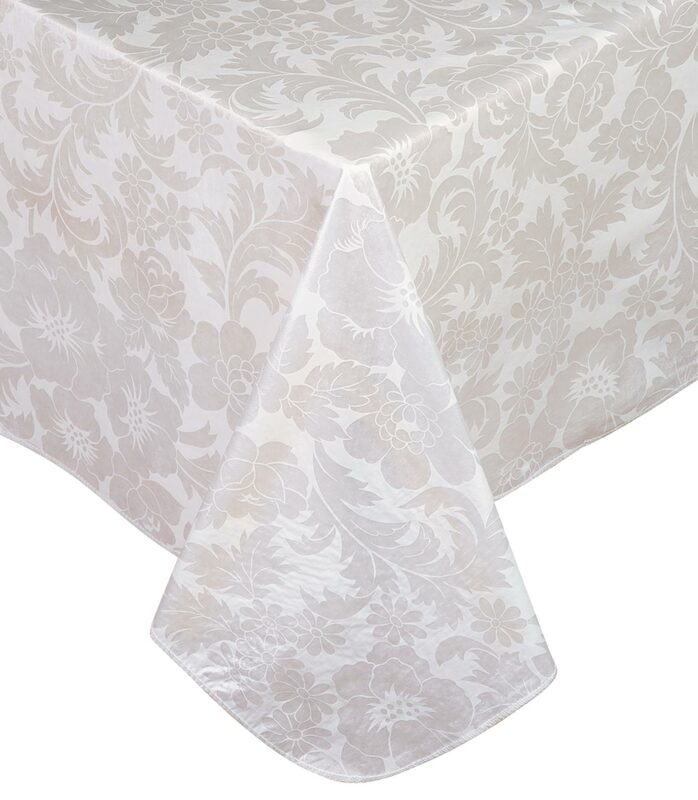 I love these --- They keep my tablecloths nice and clean and don't obstruct the view of my lovely table coverings. Great price and well made! I have had trouble finding a plain place mat and when I saw these, I was happy and hope they are all that I want them to be. Protects my wood end tables. Have been looking for clear mats to show off my antique table cloth. Love them! You can see the beautiful antique table cloth all the while it is protected! Help me keep my table clean! I like the clear color so it matches whatever tablecloth I have on! looking for something that was a perfect 'neutral' without clashing with different tablecloth designs. I put them on my Cambria counter when I have company. You can still see the beauty of counter and gives protection..
To protect table cloth while not disturbing the look of the table cloth. Great for grandchildren when using a tablecloth! My husband prefers the clear placemats. I can show off my embroidered table cloth and protect it too. WANTED TO TRY THESE . 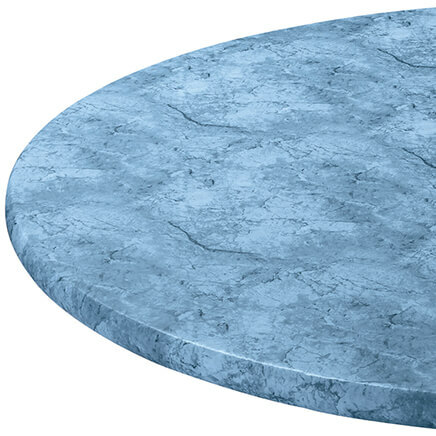 I have a family of slobs, and I'm hoping I can cut the edges to fit my round table. I want to put on top of our pretty placemats! 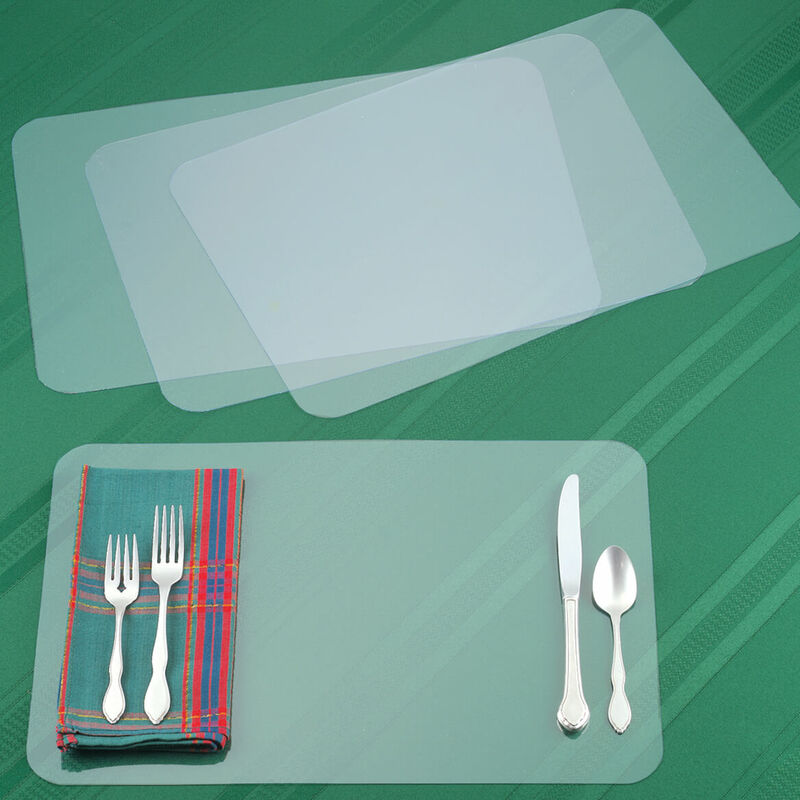 I chose these clear placemats, because my mother was searching for some. She will be pleasantly surprised when I give them to her. When I can’t find what I’m looking for in the stores, I resort to my magazines like Miles Kimball. Love it! Protect table and easy clean-up after grandkids! Because I have a beautiful table that I want to see, not hide . Have used these for years. Unfortunately, they are really pricey when you include shipping and handling. These are fantastic for tops of nightstands. Can't tell that they're there and they keep things from scratching the top and no need for coasters. They wipe clean easily. I use them at my kitchen table so as to not hide the beauty of the finish. To protect the good table cloth without having to put plastic over the whole table. Will these matts hold up to a hot dinner plate or will they melt? Thank you. BEST ANSWER: These are sturdy enough that a warm to hot dinner plate will not melt, a very hot plate might indent the surface, but should not melt. I got them for doing craft projects on to protect surface of table. I never put anything too hot on them. I would think a warm dinner plate would be ok, but I don't really know and as I no longer have them I can't try. we use them daily and they hold up well. We've had no issue with them melting! They will melt unless you place a hot pad under the place. Do clear placemats take the polish off any types of wood tabletops? I wish I could help you with that, but I use mine in my refrigerator, so easy to keep clean. I have not had that problem and I use mine on a wooden table. BEST ANSWER: Thank you for your question. these are not microwave safe. We suggest only wiping to wash. We hope this information will be of help to you. How thick are these? Can they be bent or are they stiff plastic? BEST ANSWER: Thank you for your question. The placemats are flexible. They are less than 1/32” thick. We hope this information will be of help to you. They look more frosted than clear. Are they truly clear? BEST ANSWER: Yes. I bought two sets and they are completely clear, not frosted at all. They also look great on my table and are easy to clean. They are clear. Reflections make them look frosted in photo but they are clear in person, albeit thin. They are a bit frosted but on top of a colorful table cloth they look very nice. Yes, these placemats are clear. Are the placemats heat resistant? BEST ANSWER: No, they are not. Anything hot placed on them will leave an impression. They are very flexible, also. No,they are not for use as hot plates. They have withstood mild heat from the microwave. What size are the placemats? BEST ANSWER: Thank you for your question. The placemats are 18" long x 11 3/4" high. We hope this information will be of help to you.